The website Films of Being likens Terrence Malick to a modern-day American Transcendentalist, in the style of Ralph Waldo Emerson or Henry David Thoreou. There is a good deal of merit to this claim: Malick's films are suffused with lingering shots of nature and meditative voice-overs examining a sort of transcendental, mystical spirituality. Malick himself is also a professional philosopher: with a philosophy degree from Harvard, an unfinished BPhil from Oxford (the university's most notoriously difficult degree course), and teaching experience at MIT. It's exciting, in a way, to have a real, live philosopher making real, live philosophical movies, and it was exciting for us to identify the threads of metaphysics and mysticism in what would otherwise have been a typical World War II movie. The battle of Guadalcanal. These scenes were gorgeous. 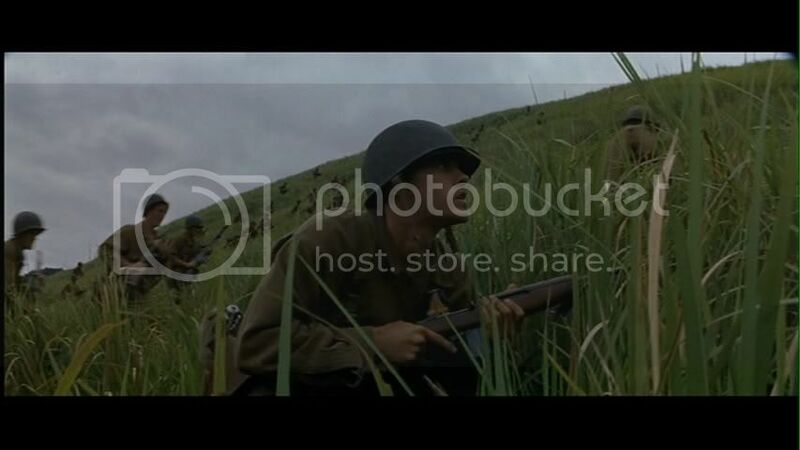 The Thin Red Line, Malick's third film after a 20-year gap, is, in many ways, highly cliched: a World War II movie told from the grunt's point of view, with a large ensemble of celebrities, and numerous scenes of alternating horror and bravery. What sets this film apart is, of course, Malick's magic touch: his style of filmmaking is particular enough that some scenes - such as the initial assault, onto the beach, or up the hill - are genuinely fresh, inventive, exciting and terrifying. Nonetheless we at the PPCC were somewhat disappointed, because even an intelligent director like Malick eventually crumbles under the weight of his film's content. At times, it felt like Yet Another War Movie. Also, we had the added difficulty of recognizing some lines of dialogue from UNKLE's Eye for an Eye and Explosion in the Sky's Have You Passed Through This Night?, hence rendering perhaps one of the film's most effective moments overly familiar and trite. But that was just bad timing on our part. 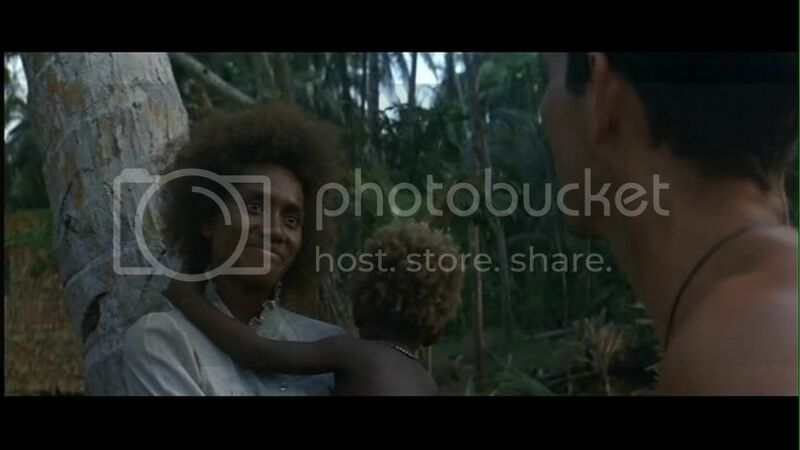 The film opens with an American soldier, Witt (James Caviezel), cavorting among the locals in an idyllic Melanesian paradise. These scenes, similar to Colin Farrell's cavorting in pre-Europeanized America in The New World, are Malick's strength: a highly idealized, intoxicating paradise, peaceful and profound, where men come to escape from the grinding wheels of the Western machine. But Witt is soon forced to leave Eden, when his American sargeant, Welsh (Sean Penn), arrives and drags him back to his old unit, the C Company. 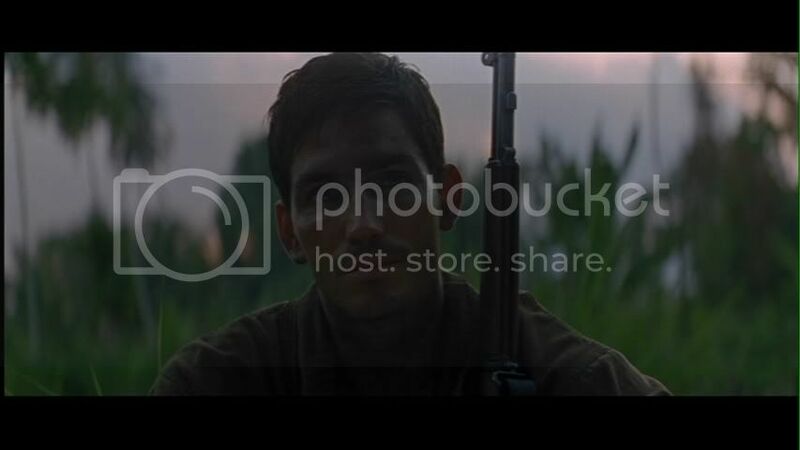 Here, the story expands and we are introduced to a number of characters: there is Private Bell (Ben Chaplin), aching to return to his wife (Miranda Otto), there is the captain who is trapped by orders he cannot obey (Elias Koteas), the maniacal and aging Lieutenant Colonel who is desperate for a promotion (Nick Nolte), and so on. What's interesting is how many very familiar faces appear for only a few moments: actors like John C. Reilly, George Clooney, Jared Leto, Woody Harrelson, Adrian Brody and John Travolta appear sometimes for only minutes, for only a line of dialogue. Unfortunately, this superstar-studdedness wearies our suspension of disbelief, turning the battle of Guadalcanal into a cameo-a-thon. 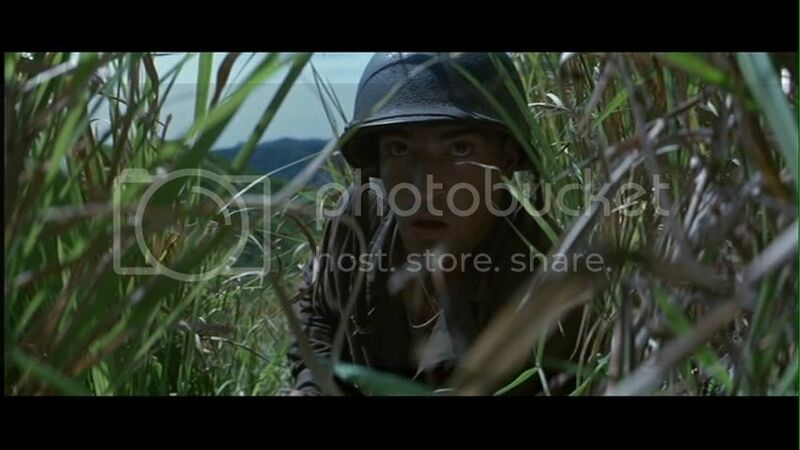 At least, our disbelief was really broken when John Cusack arrives to lead a raid on the Japanese bunkers. We just saw him in frickin' Martian Child (avoid, yaar), how can we take him seriously now?! But that's the genre. Ever since those old school WWII movies like A Bridge Too Far, it seems like these things have to become celebrity clown cars. And Wikipedia says Gary Oldman, Bill Pullman, Viggo Mortensen and Mickey Rourke also acted in the film but had their scenes cut. For the love of God! Indeed, all the familiar trappings of the genre are here: the horrific death of a comrade, men displaying courage and fear, the high-strung tension and explosive violence. Thankfully, Malick underplays the violence, underscores the men's fear, and generally remains contemplative even in all this chaotic, overly familiar noise. The result is a thinking viewer's war movie, and the best moments are those that present the war indirectly, as a vehicle for philosophical meditations. Witt, who is more or less the protagonist, is presented as almost a Buddha-like figure: enlightened, serene, eternally compassionate. (We can understand why James Caviezel was a shoe-in for The Passion of Christ: he can look so benign and spiritual!) Some critics have noted a quasi-Buddhist theme to the film, but we would argue that it is Christian-centric, just like American transcendentalism always is: at least, Witt uses concepts such as soul, grace and glory. While his fierce compassion and his musings on interdependence are certainly Buddhist-like, his belief that there is a "spark" in everyone and everything, and his faith in a better world out there are much more reminiscent of Judeo-Christian mysticism. "Maybe all men got one big soul everybody's a part of," Witt says at one point, "all faces are the same man." We're convinced, also, that Witt is short for Wittgenstein, one of Malick's favored philosophers. In fact, we wish we knew more about Wittgenstein, just to pick up on other themes. Witt, for example, is often also associated with death - he acts as stretcher bearer for a time, his voice-overs often focus on death and the death of his mother (told in flashback), and he is shown often as the hand-holder and bedside comforter. He is also associated with birds, both caged and uncaged. We can't make heads or tails of this yet. The most satisfying moments in the film are also the interactions between transcendentalist, emotionally engaged Witt and Sargeant Welsh, who is instead cynical, numb and unable to "see the spark" in life anymore. When one character dejectedly tells Welsh he doesn't feel anything anymore, Welsh replies: "Sounds like bliss." Yet it is clear that Welsh is drawn to Witt's faith and spiritual idealism, even as he finds himself incapable of feeling it himself. These two characters have a number of fascinating dialogues where they basically circle each other, curious, holding a sort of plain-clothes philosophical debate. The cynic. Side note but Sean Penn is so hot when he's Byronic. Overall, the film is wonderfully evocative, as much as it is cerebral. Of course, something wouldn't be transcendental if it didn't emotionally engage us! Unfortunately, the film has to tediously tread down several well-worn paths in order to make its philosophical points, but thankfully the ride through even these cliched scenes is well-handled and original. There are some surprises - John Travolta turned his cameo into an amazingly fleshed out character, and likewise for Jared Leto! - and we can't honestly say anything is badly done. At worst, this film is conventional. At best, it is transcendental! Huzzah, mission accomplished! A note about the DVD: our copy comes with a special feature of Melanesian songs. If you haven't heard Melanesian music before, this is a brilliant introduction. Some of the tracks - 10 and 11 - are sublime, and, while we were listening to them before the film, we were already thinking in the epic terms of a universal human experience that art like this sometimes provokes! The only criticism we have is that Malick didn't use this music enough in the film itself! Hey, I am looking for a world war movie in which two soldiers of a group are either seperate from it or desert their group and go through jungles and war ravaged europe and enter a village where they go to seemingly deserted house which is actually occupied, by a lady some kids and a young woman who always wears a mask and also a man who comes after some time. there's a handicapped kid who later in the movie blasts a tank sacrificing his life and when the two soldiers enter the house one of them tries to molest the lady and later out of guilt or what he comes out of the house screaming and goes straight into an incoming shell and is dead...i don't remember when i saw the movie..may be half asleep or may be some time ago on tv where i could not watch full.. tried searching but couldn't.. in this attempt have watched many mindless WW movies... can anybody help with the name?? We're convinced, also, that Witt is short for Wittgenstein, one of Malick's favored philosophers. That's kind of a weird thing to be "convinced" about, given that this is actually the name of the character in the novel on which the movie is based. In fact, James Jones cut the name down from "Prewitt," a basically identical character in his previous novel. Sorry to be pedantic years after the fact. But seriously..."convinced"? Jesus.